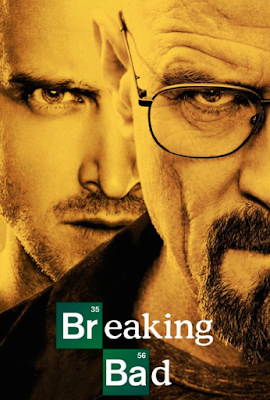 I watched 'Breaking Bad' from the very beginning in 2008, and followed along every week it aired until the show ended in 2013. It is one of my favorite TV shows of all time. A high school chemistry teacher gets a terminal cancer diagnosis, and starts to produce and sell meth with one of his ex-students, so he can make some money to leave to his family. It is one of the best TV shows in existence, at least in my opinion obviously. The extremely unique storyline, the ups and downs, dark and twisty turns, character development, superb acting, simple real-life sets, subtle humor, intense situations, etc. Even if it's not your type of show, it's definitely worth a try. Watch the first few episodes and see if you can get into it. Some people read the short summary on IMDb.com or hear about it from a friend and pass on it because it sounds weird. Chemistry teacher who sells meth. WTF, right? You just have to move past that and start watching to realize how complex and interesting the show is. NYX Intense Butter Glosses pack more pigment punch than the original, more natural-looking Butter Glosses. Of course I had to pick up some of the colors. The addiction is real, ha. NYX Butter Glosses are so easy to apply, and they're very comfortable to wear. If you don't eat or drink much right after you put it on, the color will stay there for a few hours before you have to re-apply. They have a pleasant cake or vanilla scent from the tube, but they don't smell like much on your lips. It's a good way to add a bit of color when you just want a simple, natural touch, nothing too bold or crazy. Currently I have: All of the colors except for 13, 14, 16, 17. 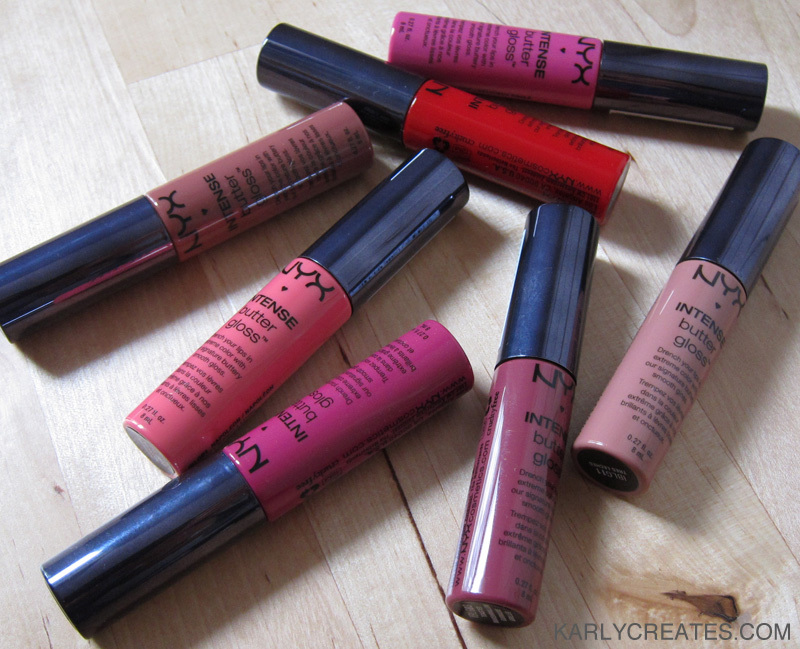 NYX Soft Matte Lip Creams are fun to try out and have in one's collection. Although I don't like them as much as the NYX Butter Glosses, I can appreciate that they dry down to a matte finish for a little more staying power. They are a bit chalky I suppose, but not uncomfortably so. My bf didn't really care for them, but I don't think boys understand why girls like matte lip products. He prefers natural looking gloss or just my bare lips, go figure..ha. Glosses don't last long enough though, so in came the trend of matte lip creams, lip stains, stay all day and everlasting liquid lipsticks, etc. NYX Soft Matte Lip Creams aren't that long lasting, but they fall somewhere in the middle in terms of comfort and wear time. 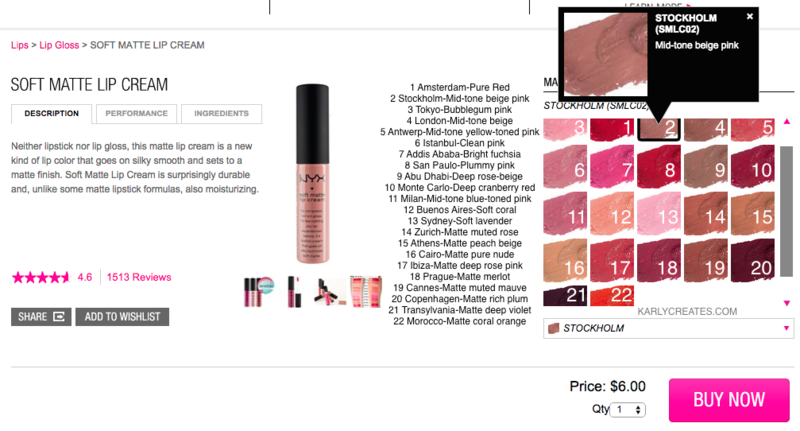 For some reason, on the NYX site, the swatch numbers are a little mixed up right at the beginning (it starts with 3, 1, 2, 4 and then goes on in the correct order. I clicked on one of them in the screenshot, so you can see the numbering.) Oh well. 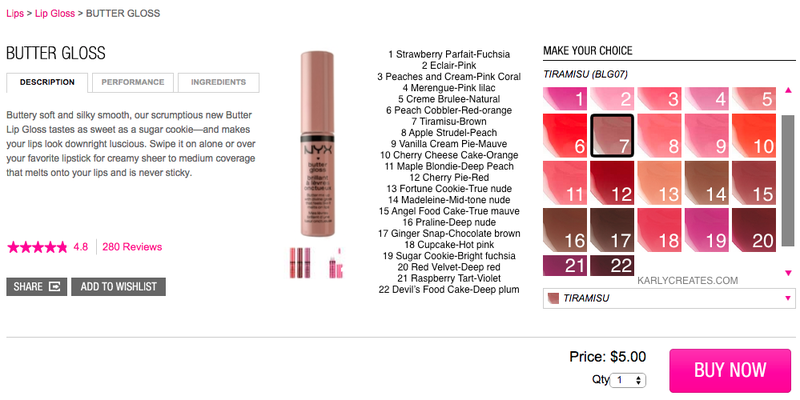 Anyway, I've put the numbers, names and color descriptions to the left of the site swatches for quick reference. © 2015- Karly Creates. All rights reserved.